What Is a Pinkie Mouse? "Pinkie mouse" generically describes a wide range of live or frozen mice that are fed to reptiles and amphibians. It's also a specific term describing a particular size and age of feeder mouse. As reptiles and amphibians grow, they typically progress from eating pinkie mice to larger types of mice or even rats. Check with your breeder for specific information on when to switch your animal to larger food items. Many reptiles and some amphibians are carnivorous in the wild, and mice make up a large part of most carnivorous natural diets. Commercial foods are available, but their nutrient balance varies widely. Some reptile owners supplement their pet’s diet with other prey animals, such as crickets for a small lizard or chicks for a large snake. Experiment with different options to find the best balance for your pet. Pinkie mice are the youngest and smallest of the feeder mice. They are less than 5 days old and do not yet have fur. They get their name from their pink coloration. Fuzzies are between 5 days and 2 weeks old. They are just starting to develop a coat and have not yet opened their eyes. Hoppers are 2 to 3 weeks old. Their eyes are open and they've begun to feed on their own. Weanlings are 3 weeks to 1 month in age and are newly adults. Mice over 30 days old are considered adults, but may be available in a variety of sizes. As your pet grows and develops, you might want to switch from mice to rats. Rats follow a similar progression to mice, except that rat pups come between fuzzies and weanlings. A rat pinkie is roughly the same size as a mouse fuzzy. 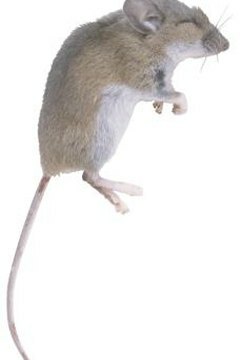 Rat fuzzies are approximately the same size as mouse hoppers and weanlings. Rat pups are the same size as standard adult mice, while rat weanlings are about as big as extra-large mice. Adult rats range in size from slightly larger than mice to bigger than a typical rabbit. Pre-killed pinkies and other feeder animals are highly preferable to live prey. Although reptiles and amphibians normally kill their prey in the wild, the confined space in your pet’s habitat makes this practice dangerous. If your pet isn't ready to eat when you introduce a live animal, the prey animal might attack. Even during a regular feeding session, some prey animals fight for their lives, potentially injuring your pet. In addition, the small space does not allow room for a normal chase, which often covers great distances in the wild. You can kill the prey animal yourself, have your supplier do it, or order frozen feeder animals from a mail-order supplier. Defrost frozen prey before feeding it to your pet.